Holding Power in Miniature. The Line Tensioner that locks lines securely and is easy to release. Out-performs traditional alloy and plastic guy runners. Ideal for ultra light weight tents and tarp set ups. 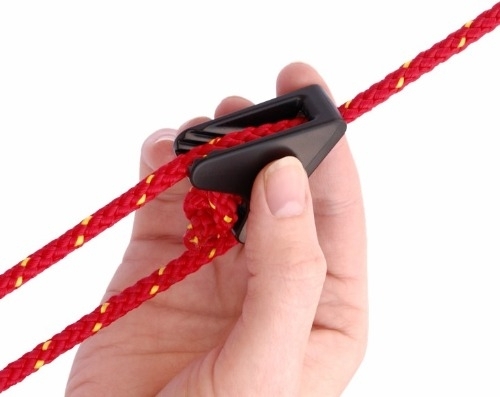 These extremely handy line tensioners make putting up a tarp or tent a complete breeze. With no need to learn complex or fancy knots the Line-Lok will accept lines from 2mm-5mm and comes in green colour. The Line-Lok cleat uses advanced tooth technology to securely hold all types of ropes and guy lines from 2mm to 5mm diameter. For example, 550 Paracord works perfectly. Also holds shock cord (bungee), especially 3-4mm (1/8"-5/32"). Quick to tension. Easy to release, even when wearing thick gloves. Will not shake loose, even in extreme conditions. Tested in conditions from +40°C to -40°C (100°F to -40°F).